I think mushrooms are really cool organisms. I don’t know much about identifying them; I just like looking at them. After lots of rain, they simply appear. You don’t know when, where, or what kind, but the spores are hanging around and the mushrooms just show up. I leave them in my yard when they appear because I like how they look. All sorts of varieties, shapes, and colors; it is all part of nature’s visual artwork. When I see these little creations of nature, it reminds me of walking through the woods at my childhood home; mushrooms would be scattered throughout the woods. There were also lots of books I read as a child with illustrations of fairies sitting on the tops of the mushrooms. We have had a lot of rain here in Charlotte lately and when I walk around in my yard I find mushrooms all over. I think they are lovely and when I see them they inspire stories. They remind me of legends, folktales, my youth, the woods, and my childhood home. In fact, I think there is even something spiritual about these lovely little things just appearing. Here are some pictures of the mushrooms that have appeared in my yard this week. 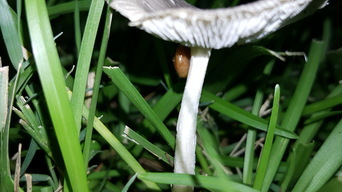 One of them even has a little buddy attached to it; a snail is taking refuge under the umbrella of one of them. Can you find it? You can also get lots of information about mushrooms simply by searching for mushrooms. Here is one reference I found that you might find interesting. I have come away to the mountains to take some time for myself. I need it. Being alone gives me some time to think, pray, and consider what my next step should be. I grew up in the Catskill Mountains so I need to go back to the high places at least once a year to get grounded again. These are not the Catskills, they are the Blue Ridge. They are part of the Appalachian Mountain Range, as are the Catskills, so when I am here I am connected to home. There is a deep thread that runs through these mountains. It was not placed there by man, but by the Great Creator. It ties me to the trees, the stones, the plants, and the stories that sail on the wings of the winds in the high places. It takes a quietness of heart to hear the stories. When I leave, I know all of the living beings of the mountain; the trees, flowers, plants, and yes even the stones, will say to me, "We will miss you while you are gone. Come home again, won't you? Come sit in our lap again, listen as we tell you another story, and please share your adventures with us that we might add more volumes to our collection. Come back again, won't you?" I wave and say, yes, of course... the mountains are truly my mother earth. I went to an estate sale today (think mega yard sale). As I walked through the house looking at everything, I wondered what the story was, so I asked Penny, the girl running the sale. It was a familiar story: The man who lived there needed to go to an assisted living situation. "He took all he could, and this is what's left," I was told. The more I walked through the house, the more I imagined his story. Many of the items were from other states and other countries. “They traveled quite a bit,” I thought. I noted the feminine touches throughout the bedrooms: porcelain dolls, ruffled curtains, flowered wall paper. I was sure that the man and his wife had lived in the house for most of their lives—they raised their children there, had family dinners, perhaps some arguments and of course some agreements. The grandchildren came over from time to time. As the years passed the wife eventually left the earth, and the man was left alone in the house. He loved his wife so much, and he found it too daunting to rid himself of her trinkets and decor. My attention finally landed on the vintage jewelry. There were bracelets and pins, necklaces and some beautiful silver charms, most from other states and countries. They weren't attached to a charm bracelet or necklace, rather just lying about in a box. I collected as many as I could, and I took them to Penny. I also found a monkey puppet and a copper bracelet that needed a bit of repair. "How much?" I asked. "How about $12 for all of it?" Penny replied. "That works for me," I said, already deciding to put the charms on a single bracelet. I will wear it, and I'll think about the stories behind each of the little icons. I might even write a story that's inspired by those charms that were held for years in that box. They stayed there, silent, as life when on around them. Perhaps they were waiting for someone to come along and tell a story about them. Well, I can do that. And if the lady who collected these is watching from above, I want you to know that I will wear these charms knowing that you've added to my charmed life.